More people than ever are clipping coupons for their supermarket trips, but they’re often not saving as much as they could, says Toni House, author of How to Reduce Your Weekly Grocery Bill to $85 Per Week – Or Less!. "You can easily shave $5 to $20 off your weekly grocery budget with a minimal investment of time," says House. "Cutting your bill just $10 a week will save you $520 over the course of a year. 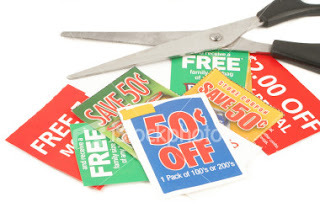 "Taking a couple of extra steps to ensure you can use all the coupons you clip will save you more money – and protect your investment of time in clipping them." How can consumers take advantage of coupons without becoming consumed by them? • Learn different stores’ rules. Call the grocery stores that are convenient to you (near home OR work), ask these questions and write down the answers: Do you have double or triple coupon days? (If so, what are they?) Do you accept other stores’ coupons? Do you allow "stacking" coupons – using them on sale items? • Seek coupons far and wide. The Sunday paper is always a good place to start, but most households also get coupons through direct mail. And you can find coupon deals at SaveYourMoneySaveYourFamily.com, Coupon-Lady.com and a host of other sites. If there are brand-name products you just have to have, try Googling the name and "coupon." • Plan meals around your coupons. Say you have coupons for 30 cents off a box of pasta, half-off spaghetti sauce (a type you normally buy – not a pricey splurge! ), buy-one, get-one canned mushrooms and $1 off a pound of ground chuck. Can you smell dinner simmering? For less than $4? • Organize your coupons. An expandable folder, like you might use for taxes, is a convenient place to store coupons at home. You might organize it by product – frozen foods, snacks, meats, or by expiration date. If you’re going to do some meal planning around coupons, you might want a section for those. As you clip, sort the coupons immediately so you don’t end up with a big pile that never gets sorted or used. Clip the meal coupons together and drop them in either the meals section or, if you’re organizing by date, the date the first one is set to expire. • Save up to 30 to 50 percent with "shopping club" cards. Many supermarkets now offer "shopping clubs" that provide members with special in-store discounts. These are no-clipping-required coupons that never expire! Sign up for free and get a "membership" card that clips to your key ring. When the cashier swipes it, the discounts are applied to your grocery bill. Some stores have an associated website where you can log in while you’re planning your shopping list and see what discounts are available that week. • Upload coupons directly onto your shopping club card. Stores that have a shopping club website may also post manufacturer and brand coupons there. Log into the site with your card ID number, then click on the coupons you want and they’ll load right onto your card! Instead of carrying coupons to the grocery story, you get your discounts when the cashier swipes your card. • Organize your shopping club cards and coupons with your smart phone. If you shop at a lot of stores, you may be carrying around a lot of shopping club cards. Ditch the cards by loading them on a free club card organizer app available soon at saveyourmoneysaveyourfamily.com. You’ll also soon find a free coupon organizing app there. It will allow you to click on coupons online and load them onto your phone for the trip to the grocery store. Planning ahead is the most effective way to use coupons. Since we know you would never dream of heading to the supermarket without a list -- because that’s a huge money waster – just match your coupons to your shopping list before you head out the door. Imagine, if you save just $1 a week with coupons, you’ll have $52 extra at the end of the year. And then you can get that splurge spaghetti sauce – and the 24-ounce tub of lard! Guest article provided by Toni House who has a bachelor’s in accounting and a master’s in business administration and was most recently the senior consultant and owner of an accounting firm. "How to Reduce Your Grocery Bill" is her second "Savvy Shopping" book. Her first was "Save Your Money, Save Your Family." Find her money-saving blog tips at www.saveyourmoneysaveyourfamily.com.